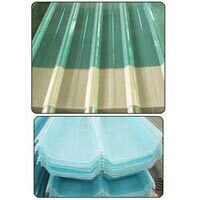 We are engaged in offering our clients with an optimal quality Polycarbonate Roofing Sheets, which can be used internally and externally as well. These sheets require low maintenance, offer easy installation, and are remains tough and stable even in worst weather conditions. Our clients can avail these sheets in plain, as well as customized form. Most of the polycarbonate roofs offered by us are clear, embossed and delivered within two weeks. Further, whenever possible we use our own delivery fleet for delivering the range at client's end. Manufactured as per the latest market trends, our range has an excellent impact resistance fire rating, relatively simple to work with and comes with a 10-year warranty.